After my experiences on Wednesday, I woke up this morning knowing that I needed to recenter myself. But, like I’ve mentioned before, there isn’t a ton of time in my life to just sit and ponder, so this morning I found myself saying simple prayers. informal prayers. prayers from the heart. God, please help me honor You today. Help me choose well. Help me. Help me. Help me. I am dependent upon you. I rely upon you for strength. Help me God. But with just that prayer… just that prayer alone… I found myself able to resist all that “junk” today. Not saying it was an easy resistance, but I resisted nonetheless. And well, whadda know? 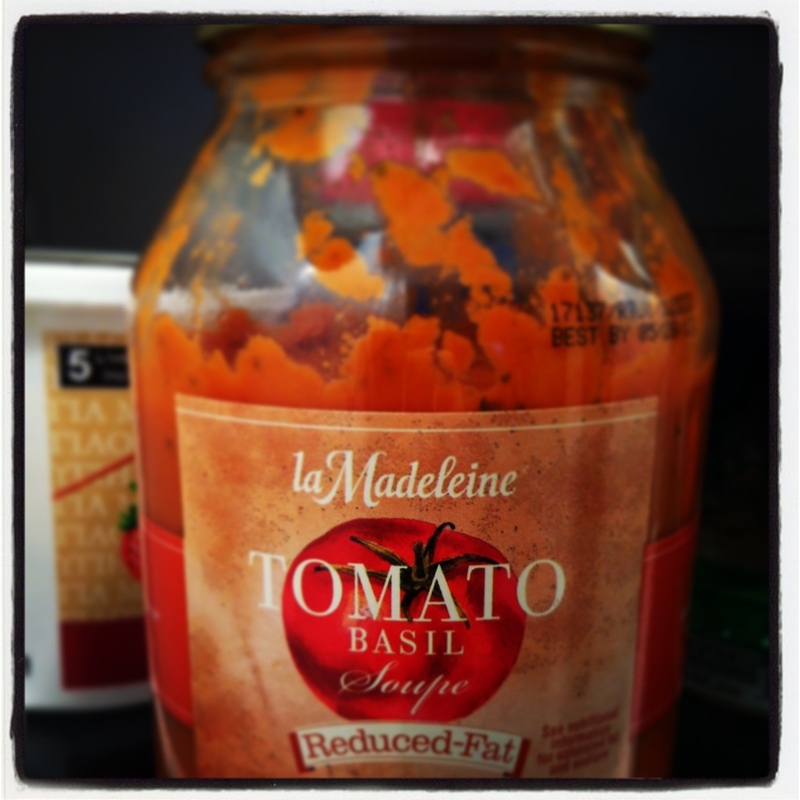 My mom got me some of my favorite winter soup for Christmas… Tomato Basil from La Madeline’s! Sooooooo gooooood. So, that’s what I chose for lunch. I have lately really wished that I had cataloged everything that I ate at first because it was all so easy. so perfectly filling. so tasty. But then I am reminded that it felt that way because the goodness of the Lord was a new taste to me… the power of God was a new flavor… the sufficiency of God was a new feeling. It had so little to do with the foods that I was choosing and so much to do with Who I was choosing. But, all the same, I want to remember… I want to get back to the basics of how I started. Things like prayer, bible study, and good foods. And as I looked for a verse today about remembering His Goodness from the past, I found this verse… well, I found the second verse but the first just really snagged me as well. But look at that. Remember: 1) the wonders he has performed, 2) his miracles, and 3) his rulings. And I have those in my own life: 1) enabling me to have the strength to stick to a covenant, 2) me going for a year without sugar, 3) his commands against gluttony and lust and greed. When I remember the wonders he has done and his miracles, then I want to remind myself of His Rules because I have been reminded already, twice, of examples of His Goodness… makes me more prone to remember that His Rulings are for. my. good. and they are for. His. Glory. I have been amazed at how quickly being on a hard-core Daniel Fast has shown me that I was a bit more dependent upon processed foods than I realized. Yesterday I was a little shocked at how little I had to eat in the house. None of it was “horrible” for me per se, but there is just a sea of pretzel chips, pastas, rice, breads, cheese, eggs, etc that I kept trying to revert to at my meal and snack times. Granted, I really need to go to the store to get some more fruit options. I find myself not wanting grapes (which will work out fine because my youngest lovvvvvvves them), but I tend to really enjoy cantaloupe, pineapple, apples, clementines, raisins, peanuts, avocados, and carrots as my “easy-to-eat” options. My favorite “cooked” thing is certainly potatoes! Yummmmmm! And I just ran out of La Madeline’s Tomato Basil soup which is deeeeelish. I bring up all of those foods to remind myself that even though I might have felt like this was an incredible sacrifice, it’s actually quite yummy. I think I’ll even purposefully do a “Hard-Core Daniel Day” each week for the duration of my covenant just to refocus my mind off of processed “easy” foods. But also… you know, the point of “Lenting” is to focus my mind entirely on Christ, and my mind often goes to Him fasting in the desert for 40 days. Let me break that down for ya. NO. FOOD. FOR. FORTY. DAYS. I cannot even imagine that. I can’t even remember the last time I went one day without food much less FORTY. And in the hot, dry desert. And ya know, now that I think about it. I can’t remember why He did that. So, the Bible says in Matthew, Mark, and Luke that Jesus was led into the wilderness by the spirit. And then I read about Elijah and Moses’s 40 Day Fasts as well (thanks to seeing it on a Wikipedia page when I was looking for a scripture reference). Elijah was sorta “forced” into it by the spirit because he was running away from Jezebel and had to walk for 40 days through the desert going to Mount Sinai. But again, he was led by the spirit. Moses was also sorta “trapped” up on the mountain with God for 40 days while God tapped out the Ten Commandments for the covenant. Annnnnd again, led by the spirit or in his case he was told directly by God himself to stick around! Moses – doesn’t eat for 40 days but he is chillin with God Almighty – COMES DOWN FROM THE MOUNTAIN GLOWING WITH GOD’S GLORY!!! Elijah – doesn’t eat for 40 days while he has to walk across the desert – AND THEN GOD TALKS TO HIM DIRECTLY AND TELLS HIM JUST WHAT TO DO!!! Jesus – doesn’t eat for 40 days in the desert – GIVES SATAN THE SMACK DOWN AND HAS ANGELS BRING HIM FOOD! So, all of that to say, a fast might be difficult, but at the end of 40 days… God’s Power, God’s Voice And Direction, and God’s Strength To Resist Temptation… is there. That’s about the coolest thing that I have ever had to look forward to!